Tomorrow’s showtime. The hearing starts at 11:30 a.m. Eastern. The buzz on Twitter this afternoon was encouraging, with a lot of great tweeting going on about American Library Association, EFF, CREDO Action’s alerts — and ours, too. The Facebook group continues to grow, although somewhat more slowly than Twitter; and we’re close to making ‘popular’ on digg. * There’s definitely a lot of energy around the issue. Will we be able to tap into it? One big question is how much pickup we get overnight and early in the morning from bloggers. The Wilshire and Washington folks have something on the Huffington Post; Jason Rosenbaum just posted on The Seminal; will others follow their lead? Our Calling all bloggers post has simple talking points … if you know any bloggers, please pass it along to them. One way or another, we’ll get together tomorrow during the hearing for activism during the hearing. We’ll keep http://bit.ly/oct1hearing updated with the top-priority actions as we target specific Senators on the phone, Twitter, and Facebook. And of course we’ll also be sharing them via Twitter. Twitter activism is the fastest of any of the social networks, and so that’ll be where a lot of the action is tomorrow. If you’re not a member already, please consider joining — it’s easy to sign up, and our If you’re new to Twitter page has getting-started information. An extra 20 or 30 people will makes a big difference. Other than that, tonight’s the night to get the word out. Please pass the link to Jason’s post or my post on Pam’s House Blend. Retweet early and often. Share links on Facebook. And get ready for tomorrow; with luck, it could be pretty wild! * Speaking of which, if you haven’t dugg yet, please do. If you’re not a member, it’s easy to sign up. Wthashtag’s stats for the #patriotact tag. 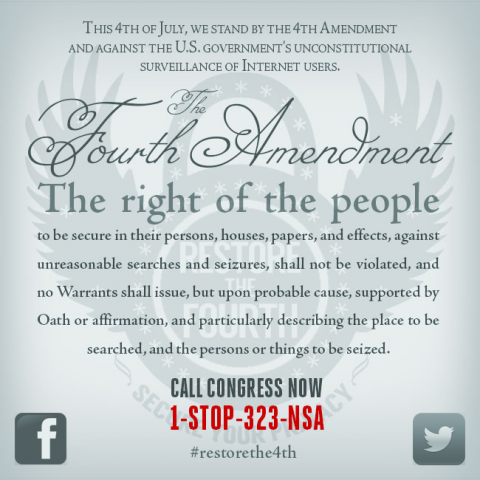 Calling all bloggers: our best chance to fix the PATRIOT Act and FISA! Update: about 5 minutes after I made this post, Jason Rosenbaum’s Tomorrow, a chance to fix FISA and the PATRIOT Act went up on The Seminal. More like that, please! 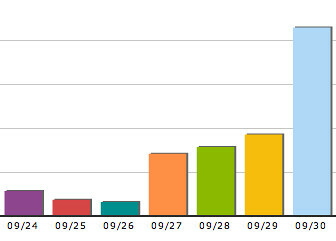 Last summer Get FISA Right’s growth on my.barackobama.com was fuelled by the blogosphere. The big blogs of the progressive blogosphere sparked things, and the the technology-in-politics blogs like TechPresident, Clickocracy, Wired, Slashdot started covering the activism story. Since then, there successful blog-fuelled social network activism campaigns propelled by feminist, LGBTQ, migrant rights blogs. So in the last-minute push to the Senate Judiciary Committee markup, it would be great to get support from bloggers of all stripes. We realize it’s incredibly short notice and there’s a lot going on. It doesn’t have to be a fancy post — something short and to the point is enough to make a difference. We’ve got lots more resources — links, embed code for videos and petitions — on our wiki at http://bit.ly/oct1bloggers. Or heck, just copy the three bullet points above as an action alert and include the “Stop spying on Americans” image above . One way or another, please try to find a way to help. And if you do post about it, please drop a comment in this thread so we can retweet it! PATRIOT Act: Please join us for discussion and activism during Thursday’s hearing! The Senate Judiciary Committee’s markup of the PATRIOT Act tomorrow today is a prime opportunity for activism. The hearing’s webcast, so we’ll be able to follow along. We can share links with each other via email, Facebook, and Twitter … and we can discuss and coordinate action. We’ll be keeping http://bit.ly/oct1hearing up-to-date with the latest priorities and discussions. If you RSVP on Facebook or Anyvite, we’ll update you tomorrow morning with the latest updates. Should we turn off email list moderation during the hearing tomorrow? The hearing tomorrow seems like a great time to have free-flowing discussion on email as well as other places. Usually we moderate the list to keep from overwhelming people with email. Should we turn off moderation? Thoughts? Please vote yes/no and (if you feel like it) share your thinking in the comments. Either way, if you’re interested in joining us during the hearings tomorrow, please RSVP on Facebook or Anyvite. If you haven’t seen it yet, make sure to check (and digg) Jon’s post on Pam’s House Blend. The newly released Coalition Letter to the Senate Judiciary Committee Urging Adoption of JUSTICE Act Amendments During Markup of Senator Leahy’s Patriot Act Reauthorization Bill. There are various “side by side” comparisons of the bills from Marcy Wheeler of FireDogLake.com, Julian Sanchez of the CATO Institute, and the CDT. The American Library Association sent out an action alert. Ed Brayton from Science Blogs argues for the necessity to roll back the Patriot Act. Being a long-time Maryland activist, I have had interactions with Sen Ben Cardin (D-MD), co-sponsor of the Leahy Patriot Act Renewal bill to undergo markup tomorrow (Oct 1). I first met him more than 30 years ago. In pressing his staff for Cardin to support incorporate the Feingold JUSTICE Act provisions into the Leahy-Cardin bill, I emphasized that, contrary to Bush and Obama assertions, the Constitutional oath for President (Article 2, Section 1, paragraph 8) says nothing about keeping the people safe. It requires the President to “preserve, protect, and defend the Constitution), and hence urging a Senator to vote in Congress to violate the Constitution in the name of allegedly protecting the people is … unconstitutional. I specifically mentioned the assertions of certain White House and DOJ staff who are pressing, e.g., Dianne Feinstein of the Judiciary Committee, to block JUSTICE Act provisions. I got a rather good reception. We’ll see tomorrow. Our best chance yet to fix the PATRIOT Act and FISA! My post Our best chance yet to fix the PATRIOT Act and FISA! is going to hit Pam’s House Blend front page later this morning. Please check it out! Call @SenArlenSpecter at (202) 224-4254 and ask him to Support the JUSTICE Act! On Facebook: share this link in your feed, and join the PASS the JUSTICE Act group. On the phone: call your Senators and ask them to support the JUSTICE Act. You can find our talking points here. On the web: CREDO Action, ACLU, EFF and DownSizeDC all have sites which make it easy to email your Senators. You are currently browsing the Get FISA Right blog archives for September, 2009.